US President Donald Trump on Saturday called off a trip to a World War I US military cemetery in France because of bad weather, the White House said. 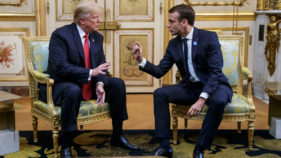 Trump was due to join other world leaders for dinner at the Musee d’Orsay art museum Saturday evening, before visiting another American cemetery that holds war dead, at Suresnes, in the Paris suburbs, Sunday morning. Some 70 leaders will gather at 11 am Sunday (1000 GMT) at the tomb of the Unknown Soldier at the Arc de Triomphe, in Paris, to mark the 100th annniversary of the end of World War I.